Winter is approaching, which means cold, frost, freezing temperatures and snow. As you're getting the outside of your house ready for winter, don't forget to blow out your sprinkler system. The damage from the freezing pipes, sprinkler heads and valving is very expensive. Let's talk how you can blow out your sprinkler system. First, turn off the water supply in the house to the sprinkler valve. Next, go outside to the How to Blow Out Your Sprinkler System for Winter with These Easy Instructions Sprinkler Valve Partssprinkler valve. Remove any caps that may be covering the drain ports. Open the drain ports to relieve the water pressure. Remove the drain valve that will allow you to connect the air supply to the valve to blow out the lines. Install your quick couple connection for your air hose. Close off the outside valve that supplies water to the sprinkler valve and drain the line if there is a drain port. Leave the discharge valve to the system open. You can use a small 1 1/2 Horse Power 115-volt AC air compressor. The water pressure in your house and sprinkler system is usually around 40 to 80 PSI (pounds per square inch). You may want to have a regulator on your compressor to lower the pressure to the sprinkler system so it does not damage any lines or valves. I use an air compressor that reaches a maximum pressure of 150 PSI so I regulate the pressure down to 80 PSI. Use a hose that is long enough to reach the sprinkler valve or use an extension cord to connect the air compressor cord to an outlet. Plug in the compressor and let the pressure build till the pressure switch turns the motor off. Now you have a full tank ready to go. Lower the pressure with the regulator to 80 PSI. First, connect the air hose to the sprinkler valve. 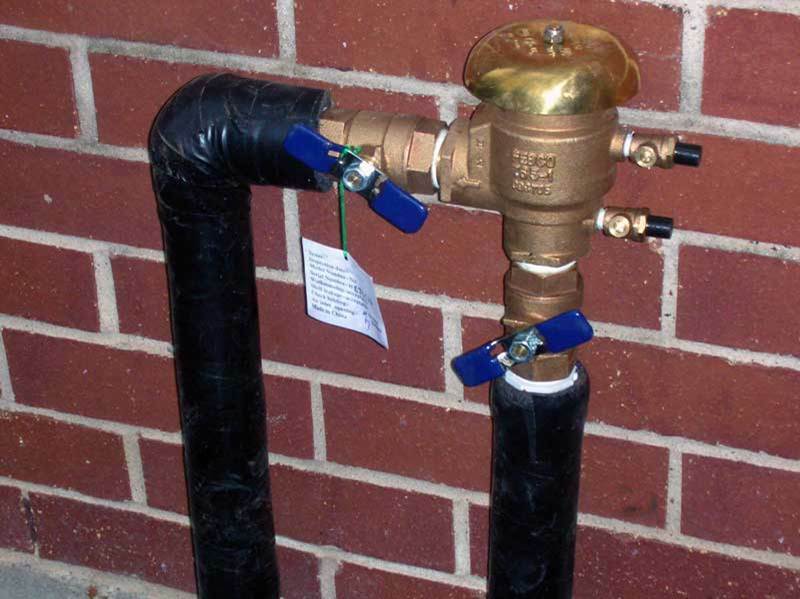 Make sure you're on the supply side to theHow to Blow Out Your Sprinkler System for Winter with These Easy Instructions Attach Air Compressor Hose to Sprinkler Valve sprinkler zone valves. Next, select zone 1 on your sprinkler system control panel. Then, turn the sprinkler system to ”ON”. Zone 1 sprinkler heads should pop up and start spraying water. They will continue till all the water is dispersed from the lines. If your air compressor's pressure drops too low and the spray heads retract back down, you may have to let the pressure in the air compressor build back up to pressure switch setting and restart zone 1 again. It may be necessary to shut off your sprinkler system several times and restart each time until you get an enough water dispersed from your zone 1. Repeat the same procedure for each zone. After you have finished the last zone, you may want to go back to zone 1 and do them all one more time just to make sure the lineare empty. 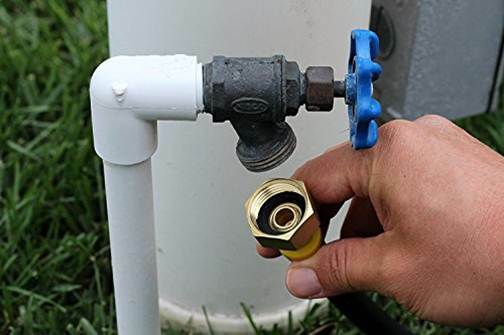 Turn off the air compressor and disconnect the hose from the sprinkler valve. Leave any drain ports open as there could be water trapped in the sprinkler valve and lines near the sprinkler valve. If the water in the sprinkler valve or lines would freeze, with the open drain ports the frozen water would have a place to drain out. Make sure to open any drain ports and drain the water supplied from inside your house to the sprinkler valve. Use a bucket to catch the water drained out. When water freezes inside pipes it has enough force to split the pipes. This would cause a major leak in the spring when you restart your sprinkler system. Your system is now drained and ready for winter. What’s great about doing this project yourself is, you can plan when you want to blow out your sprinkler system. Not when someone else is available, which could be way to early if the weather is still warm or way too late if the temperatures drop below freezing. Plus, if you blow them out and the temperatures warm up, just turn on the sprinkler system and blow out your sprinkler system again when the weather is cooler. And you don’t have to pay twice to have your sprinkler system blown out!